This “postage stamp” quilt top was started by my Great Aunt Edith (see more about Edith below) and gifted to my Aunt Judy who requested my help in finishing the quilt since my studio is an easier place to assemble quilts than her dining room table. The top was hand pieced together from 3,456 squares. Each square is a finished size of approximately 1.375 inches. The fabrics alternate between solids and mostly florals in four block groupings. My guess is that these were then assembled into larger grouped squares, perhaps four groups of four, which were then assembled into rows. In a few places the alternating solid-floral combination is not consistent, but I think that adds to the hand made charm of this top. To stay in keeping with the style of the quilt, and its hand made nature, I decided to hand tie it. This is a long process and I highly recommend you use a quilting frame, or large table to spread the quilt on during this process. I tried hooping first, but this pulled the hand stitched pieces too unevenly and made for distortion. I ended up taking those out, spreading the quilt sandwich (top-batting-backing) out on my work table. It worked great to have things as flat as possible when adding the ties, with the excess folded/rolled neatly to the other side of the table. Patience and a good audio book is then recommended. As a young woman, Great Aunt Edith made a living as a foundation saleswoman in the midwest – a best guess is that this photo is from that time in her life. Edith Foot was born in Bath, Maine on July 6,1879. Her maiden name was Oliver. She married her first husband Thomas Ashley and then on Aug 5, 1944 married her second husband, Arthur H. Foot who was my grandmother’s uncle. 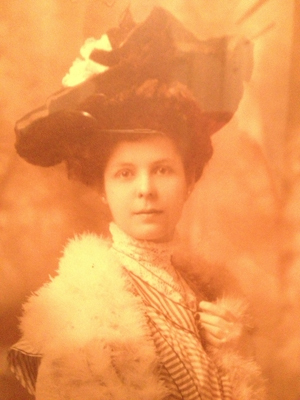 After her second marriage, Edith lived in Johnstown, NY. She died in 1980 at the age of 101. She passed along this quilt top and another partially completed top to my Aunt Judy sometime in the 1970s. I don’t remember ever visiting Great Aunt Edith, but Aunt Judy recalls Edith as a warm, friendly, giving lady who enjoyed family visits and stayed in touch with Grandma via letters and phone calls throughout her lifetime. 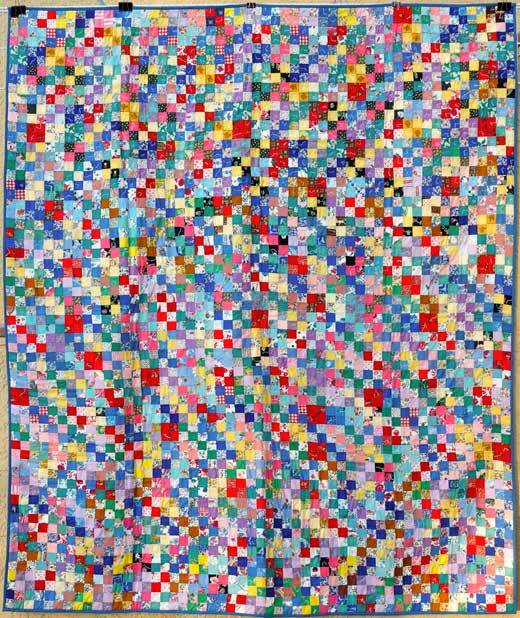 When I was assisting my parents in moving out of my childhood home we found two completed quilts labeled as gifts, one each for my sister and myself, that had been packed away in a trunk since the mid-1960s. The note on them just said, “For Alice io and Molly Callisto, from your Great Aunt.” Perhaps these too were made by Great Aunt Edith, but without a signature on the note, or anyone who remembers it may remain a mystery.